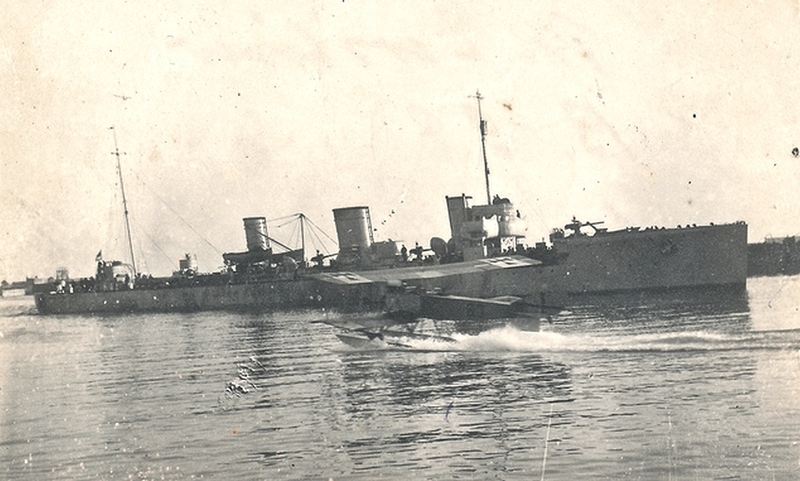 The ship in the back is identified as a a Destroyer Torpedoboat of the II. Flottille (Flottillenchef: Fregattenkapitän Heinrich Schuur). It is the Torpedoboot-Zerstörer S.M.S. “B 98” (Flottillenführerboot): Kapitänleutnant Theodor Hengstenberg. It was made around 1914 by Blohm and Voss, hence the prefix B. The B.98 saw quite some action, it was hit by a torpedo once and hit a mine, both with casualties, but they always reached the harbor for repairs. This ship was part of a large Imperial fleet which fought at the battle of Jutland in 1916 (Skagerrakschlacht). The British had 151 combat ships vs the 99 German ones.After the surrender of Germany, the British massed a large fleet of German ships in the Scapa flow (at the Scottish island of Mainland. Ludwig Von Reuter, commander of the fleet ordered to sink their own ships, rather than handing them over to the British. The B98 survived this along with 7 other boats, but over 50 were destroyed. The British did end up scrapping the survivors later anyway.